Otto von Guericke (originally spelled Gericke) (born 30 November 1602 (Gregorian calendar) in Magdeburg, Germany, died 21 November 1686 (Gregorian calendar) in Hamburg, Germany; 20 November 1602 - 11 November 1686 on the Julian calendar) was a German scientist, inventor, and politician (mayor of Magdeburg from 1646 to 1676). His major scientific achievement was the establishment of the physics of vacuums. He invented the piston air pump to produce a vacuum and investigated the properties of the vacuum in many experiments. He demonstrated the force of air pressure with dramatic experiments, e.g. in 1663 at the court of Friedrich Wilhelm I of Brandenburg, Guericke had joined two copper hemispheres of 51 cm diameter (Magdeburg hemispheres) and pumped the air out of the enclosure. Then he harnessed a team of eight horses to each hemisphere and showed that they were not able to separate the hemispheres. When air was again let into the enclosure, they were easily separated. He repeated this demonstration in Berlin in 1663 with 24 horses. With his experiments Guericke disproved the hypothesis of "horror vacui", that nature abhors a vacuum, that for centuries was a problem for philosophers and scientists. Guericke proved that substances were not pulled by a vacuum, but were pushed by the pressure of the surrounding fluids. Guericke applied the barometer to weather prediction and thus prepared the way for meteorology. His later works focussed on electricity, but little is preserved of his results. He invented the first electrostatic generator, the "Elektrisiermaschine." In Paris, Jean-Francois Pilatre de Rozier and Francois Laurent, the marquis d'Arlandes, made the first manned untethered hot air balloon flight, which lasted 25 minutes, reached a maximum height of 100 meters, and travelled a distance of 9 km. J. Rheden discovered asteroid #771 Libera. M. Wolf discovered asteroid #798 Ruth. G. H. Peters discovered asteroid #980 Anacostia. Y. Vaisala discovered asteroid #1407 Lindelof. The unmanned Mercury-Redstone 1 test launch failed at 10 cm (four inches) altitude. The undamaged rocket remained on the pad overnight, untethered, to allow the batteries to run down and oxidizer to boil off so it could be approached safely. Mercury Redstone 1 (MR-1) was the first scheduled flight of the Mercury capsule mated to the Redstone booster. The objectives of MR-1 were to: (1) qualify the spacecraft-booster combination for the Mercury-Redstone mission which included attaining a Mach number of approximately 6.0 during powered flight, a period of weightlessness of about five minutes, and a deceleration of approximately 11 g on reentry; (2) qualify the posigrade rockets; (3) qualify the recovery system; (4) qualify the launch, tracking, and recovery phases of operations; and, (5) qualify the Automatic Stabilization and Control System (ASCS), including the Reaction Control System (RCS). 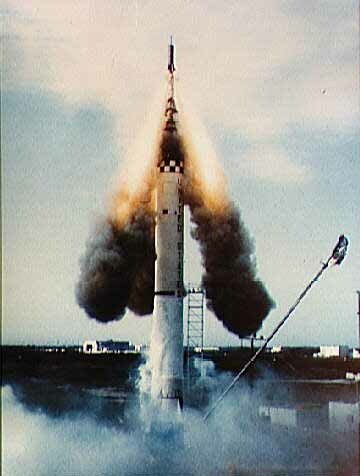 Launch of MR-1 was attempted on 21 November 1960, but after rising a few inches from the pad, the engines cut off and the rocket settled vertically back on the launcher without further mishap. The termination of thrust resulted in the escape tower being jettisoned, but the spacecraft did not separate from the booster due to g-load sensing requirements not being met. However, because the barostats properly sensed the altitude as being less than 10,000 feet, the drogue, main, and reserve parachutes were released in the proper sequence. The failure of MR-1 was determined to be due to the power and control connectors not disconnecting simultaneously. The power plug disconnected 29 ms prior to the control plug, permitting part of a 3 amp current (which normally would have returned to ground via the power plug) to pass through the relay for "normal cut-off" and its ground diode. This proved the need for all electrical connections to be grounded prior to launch. A ground strap was added for subsequent launches. The Mercury capsule was refurbished and mated to a new launch vehicle to be launched as Mercury Redstone 1A (MR-1A). A 16 second clip of the event can be found on YouTube. See also the Wikipedia Mercury-Redstone 1 page. Purple Mountain Observatory discovered asteroid #2743. NASA's Apollo 12 left Lunar orbit for its return to Earth. A. Mrkos discovered asteroid #3629. L. Kohoutek discovered asteroid #3635. K. Suzuki and T. Urata discovered asteroid #3178.